That’s Poppy ahead, in the hat, Jazz second. All the children but NBG were doing this, but as soon as they saw the camera, they would not stop looking at it! Big cheesy — and identifying — grins all round. Little hams. 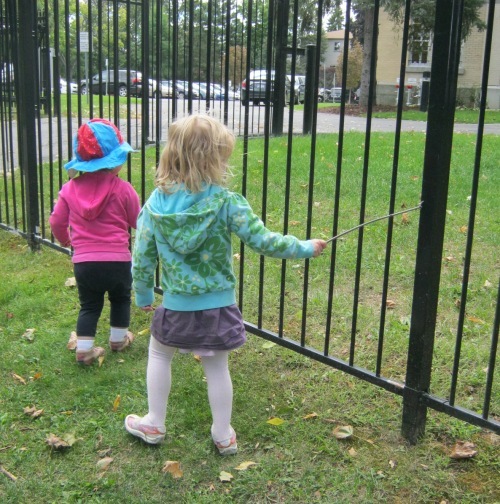 Little kids, short sticks, a long fence to make music. Some days my job provides me with little moments of absolute contentment. This was one. THIS is exactly what should be happening. Right here, right now. I hope your day, today, gives you one moment like this. When you see it, pause, and savour. You might even take a picture! Monday was too soon to tell you. It might have been a fluke. Tuesday I was still waiting to see if there’d be regression. But today? Today I think it’s safe to tell you: Poppy’s back! My cheerful, chipper, happy, decisively enthusiastic little dumpling is back, back, back! Remember how once-happy Poppy had vanished into a quivering, tentative, anxiety-stricken wobble at the advent of New Baby Girl (NBG)? And remember how, coincidentally, I was reading Growing Up Brave right then, and decided to put some of the ideas in that book to use? It took two weeks of consistent, diligent effort. I was tired at the end of every day. It’s hard work, particularly for an introvert like me, to pour out all that positivity all day long. But we did it! Okay, not 100%. But enough that I have hope. Enough that she spends most of her days in her usual happy way. It’s not that NBG still doesn’t make Poppy nervous. She does. But Poppy can now come into the house with her usual verve. She trots straight to the kitchen so we can make snack together. She doesn’t ask for a nap — until after lunch, which is a real nap, a nap for genuine sleep requirement, not an avoidance strategy. We’ve even begun to work on the empathy thing. NBG (I really need a name for this child) cries, and Poppy will now hand her her bottle. Now, she essentially drops the bottle in NBG’s lap and backs away fast, but given that her response a mere two weeks ago was to burst into a storm of noisy tears herself and beg for a nap, this is progress. Significant progress. It could be that a baby crying will always make Poppy uncomfortable, but she is learning — by doing — that she can cope with it. She is learning that anxiety may be uncomfortable, but that she can see it through, that it won’t harm her. I can warn her when a distressed noise might be about to happen. “When I put NBG in the stroller, she might fuss a bit, because she will want to start moving RIGHT AWAY, and we won’t be ready to go right away.” Then we’ll talk about what Poppy might do if NBG fusses — stand behind the stroller where it won’t be so loud, say, or even do something kind for NBG. Napping or running entirely away is no longer an option. Even better, Poppy no longer asks for a nap. What prompted me to tell you this, though, is twofold. 1. Poppy is beginning to take pride in her new confidence. “I didn’t ask a nap today! !” she declared to her mother yesterday evening, with evident pride. Whee! Now, she’s a sorta scary friend bytimes, but … friend! How about that? We’re not out of the woods yet. Keeping her calm and stable still requires pretty consistent monitoring on my part, though I’m low-key about it, and am giving her more and more space to sort things out on her own. I’m steadily raising the bar: less matter-of-fact comfort and more “you can do it, kid, away you go and get on with it”. It’s still a struggle for her. Without support, she’d probably slip right back into panic and avoidance. She can’t quite manage on her own, yet. And realistically, she’s only two! She may need support (and the occasional push) for years yet. So, yes, she still struggles. BUT! It’s a struggle that she is steadily winning. Even more significantly, it’s a struggle which she now understands is worth fighting and which has rewards for her: confidence, competence, and pride of achievement. Grace has a new dog! Not a puppy, but a large, fluffy, golden-retriever mix. He’s three years old, and absolutely gorgeous. Got the wide, friendly golden face, and the easy-going disposition. They’ve had him a week. Two days after his arrival in their home, this game started happening. That green mesh ball is one of Daisy’s dog toys. Tied to it is one of the laces from our lacing cards. But really? It is not a ball and a lace! Silly, silly people. 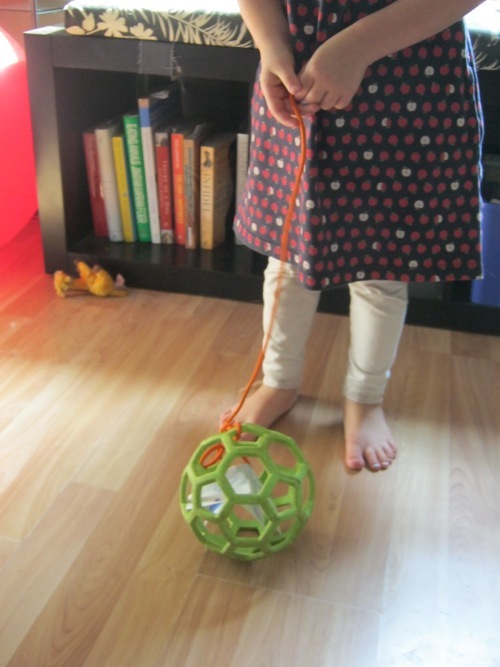 It is a DOG on a LEASH. Of course. It follows her everywhere, it comes when it’s called. (A quick jerk on the lace leash ensures prompt arrival.) And it has an EVEN MORE IMPORTANT doggie feature! Let’s look more closely. See, inside the ball? See that slip of paper? That slip of paper which Grace has carefully coloured, then torn to the right size? 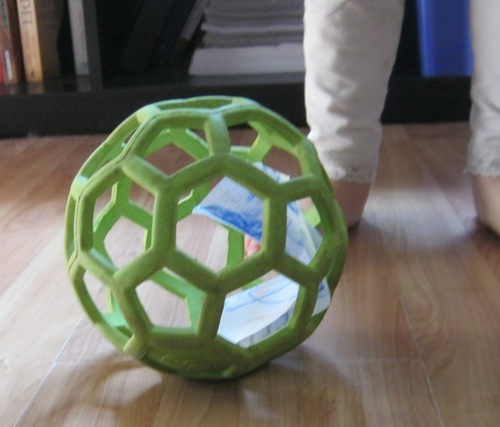 That slip of paper that fits inside the ball, but will sometimes, particularly when the doggie is running, it will sometimes fall out? That is not a slip of paper! Silly, silly people! That is POO. Because when you take them for walks, doggies POO!!! Really! And then, being the responsible dog-mommy that she is, Grace picks up the poo. With another piece of paper that she has carefully folded, to be the “poop bag”. This game is such fun! Mary laughs and laughs and laughs every time Grace plays it. Grace, and now Jazz, who, like any self-respecting toddler, will play any game that gets an adult’s so-rapt and joyous attention. They make poo so they can pick it up. Hee. Now I’m thinking. We’re out of playdough. Perhaps the next batch I cook up should be … brown? I forget where I got this. One of the Jean Paré cookbooks, I think, most likely the pasta one (which I no longer own), and tweaked some since then. I’m 110% sure it’s nothing like authentic, but that’s all right. It’s tasty, easy to prepare, and nutritious. That will suffice! This is one of those recipes which works best if you have all the ingredients chopped beforehand. Really. Chop everything first. You’ll thank me. a tablespoon or three of oil. Any kind, but sesame is particularly nice for this. 2. In a wok (ideal) or good-sized saute pan, saute garlic and ginger over medium-high heat in oil until tender. This takes about 30 seconds. Don’t overdo it. Garlic burns quickly. What you get here is a nice, scented/flavoured oil base for the rest. 3. Add protein, cook till done. 4. Add onions, pepper flakes, and vegetables. Toss lightly, till everything’s cooked. How long this takes depends on the combination of vegetables you’re using. You’re after tender-crisp, not soggy. 6. In a small bowl, combine oyster sauce, soya sauce, and curry. Pour over meat/vegetables and toss well. You may garnish with peanuts (salted is nice here) if you wish. 1. Protein: I use about one cup per three people. It’s up to you, of course. Protein can be just about anything: thinly sliced meat, extra-firm tofu cut into fingers or cubes, soft tofu crumbled in, shrimp, scrambled egg. 2. Vegetables: Again, just about anything works. This is a great way to use up leftover cooked veggies. Soft vegetables (zucchini, mushroom, eggplant, onion, etc) go into the wok raw. Some people prefer to steam firmer vegetables (cauliflower, carrots, broccoli and the like) first, but I rarely do. If they’re cut up small enough, they’ll heat through, and a little crunch is nice. Because I love mushroom so very much, my mixture is always half sliced mushrooms, and the rest whatever I have on hand. As always, if you want a recipe, just ask! Grace asked for a nap today. She doesn’t nap any more, but she did look tired, so when she said she was and asked for a nap, well, she took a nap. Because she looked genuinely tired, I opted to put her in a room, on a bed, with real curtains that could be drawn. So she could have a nap in a quiet, dim environment. She peed in the potty right before she went up. I woke her after 45 minutes. She may be tired, but I don’t want to mess up her bedtime, if possible. she managed to pee the bed. Thank goodness I’d pulled his upper sheet, blanket and comforter aside so as to cover Grace with a daycare flannelette sheet. But the lower sheet and the mattress? Big soggy spot. Ick. Grace stood to one side, watching the sopping-up and the sprinkling-on. It made me laugh. I wonder if it’ll work on my son, who has to sleep in that bed tonight? I am not a sentimental person. I don’t save many mementos and souvenirs. I don’t have overflowing folders of my children’s art work cluttering up my home. (And that’s a telling word, isn’t it? “Cluttering”, rather than, oh, “enriching”, or “filling me with happy memories of wonderful ages and stages”.) I rarely get weepy when a daycare child moves on. But once in a while, I understand the urge. I get what drives it. Or perhaps this is only my version of the sentimental drive, I couldn’t say. AKA “Fatfish”, the name carefully inscribed on the bottom of this little gem. What is it? Well, it’s a fat fish. 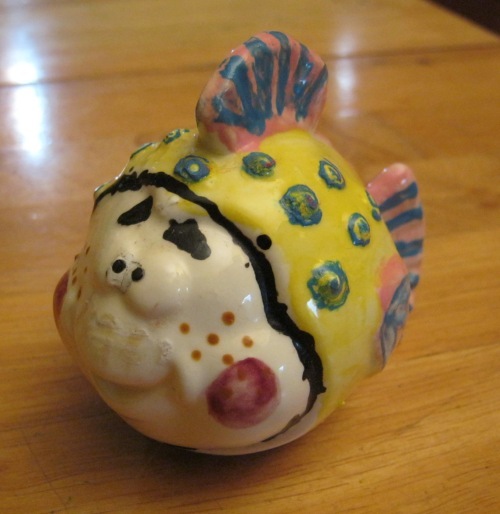 A fat ceramic fish, made at a lovely local DIY ceramic place. What does it do? Collects dust, mostly. It’s hollow, and so too light to be a paperweight. What is it for? GOD ONLY KNOWS. It’s a fat fish, people. Just a fat fish. Not because I remember how she gave it to me, her blue eyes wide with love and excitement. Because I don’t remember, not at all. When did she give this to me? Was there an occasion? Was this a birthday gift? A Mother’s Day offering? Christmas? I have no idea. Throw out fatfish? It would hurt her feelings! It wouldn’t, you know. My kids are about as sentimental as I am. “That weird old thing? You don’t need to keep it for my sake!” Because, see, she isn’t that 7-year-old any more. She doesn’t remember that seven-year-old, at least, not nearly as well as I do. She doesn’t feel the need to protect that little girl, because, for her, that little girl is ancient history. No longer exists, really. Factually, that’s true, of course. But in my heart, that seven-year-old is alive and well … and gave me this beautifully hand-crafted piece of, er, art with all the love in her little-girl heart. Looks like I’m stuck with the damned thing. How about you? Are you sentimental? Even if you’re not, is there a particular thing or two you couldn’t part with? Would you, could you, please? She does indeed. Two thick yellow streams descend from Grace’s nose toward her upper lip. As they have done all day long for the past three days. Ick. I look up again. “Uh-huh. It’s pretty gross.” Back to the book. Grace stands in front of me, looking at bit at a loss. What to do when the adult is being inexplicable? Why, repeat yourself, of course. Endlessly, if need be. Now, I shouldn’t have to give her a clue. We’ve been through this endless times over the past two or three days. Each time it goes the exact. same. way. I shouldn’t have to give her a clue, but I do. I wait some more, an encouraging smile on my face. A smile which masks the moan of boredom in my brain. How many times? How many, many times? And then, as if I hadn’t had to pry the phrase from her reluctant lips with a crowbar, I reward her with a warm and delighted smile. NOTHING could please me MORE than to get my fingers oh-so-slightly damp with the gallons of yellow snot pouring from her nasal cavities. I object, I really, really object to a child imparting what is in fact information, and expecting me to leap into action. It’s the sort of thing you often step in to solve without even thinking about. Maybe I’m persnickety. Maybe it’s because, with four or five of them doing this to me all day long, it’s harder to be oblivious. But, really? To me they feel like orders, orders which display a fundamental lack of respect, that the orderer can’t even be bothered to ask politely. Of course, that’s not it. I know that. These little ones intend no disrespect, they just don’t know the polite forms. Nonetheless, it’s a bad habit. If they don’t learn manners now, they may never learn them, or at least, they may not become second nature, which is the goal. It may not be disrespectful now, but it will be when they’re 12 or 22 or 42, and people will be less and less likely to cut them any slack for it. They’ll just be that obnoxious person who expects everyone to serve them. The person people avoid or, if avoidance is impossible, they’ll resent. On Friday, I told you about Poppy and her Huge Anxiety re: New Baby Girl. It started when NBG cried those first few days, and Poppy, little empathy crier that she is, globallized that into a full-on fear of being anywhere near NBG. She’d enter my house wailing and demanding an immediate nap, cry whenever she looked in NBG’s direction, and point-blank refuse to eat with us. What to do? I’ve already explained how I’ve dealt with the refusal to eat. Following a strategy in Growing Up Brave, I created a Bravery Ladder for the mornings for Poppy. The goal is that she come in happy, and join in the normal routines, without the need for her avoidance-behaviour ‘nap’. This was what we’d achieved by the end of the first week. She was doing well. She would ask for her nap, yes, but I would cheerfully tell her that “First we have to make snack,” and she was fine with that. We’d proceed to the kitchen, pull a chair to the counter, and Poppy would chatter at me as I sliced fruit and put it in containers, fill water bottles, and tuck it all in our snack bag. She’d count pieces with me, she’d drop things in containers. Some days we were alone while doing this — Poppy is often the first to arrive — but some days NBG, who’s often second to arrive, would be there, too, sitting in a high chair while Poppy and I worked at the counter. By the end of her second week, the nap was being deferred a good half hour, and had shortened to ten minutes. My focus in this Bravery Ladder is Poppy’s arrival, because it’s been so fraught with anxiety. Of course, sometimes NBG does cry at other, random times during a day (she’s a year old, after all) and Poppy will immediately leap to her avoidance strategy: “I want to go a nap! I tired!” At these times I have begun responding with compassionate empathy, “You’re not tired, sweetie. You’re feeling nervous because NBG is crying. But crying is just noise. It can’t hurt you.” I give her a hug, then I give NBG a hug, and then we move on. And there is no nap. This is sooooo much better than two weeks ago! I am SO DAMNED GRATEFUL for that book! 3. Poppy asks for a nap politely, but first helps me prepare morning snack, and then help me greet NBG and give her her first bottle of the morning. This is where we are now. Poppy is coming into my home, and in a happy, cheerful, so-chipper voice, saying, “May I have a nap, PLEASE, Mary!” And I am saying, equally chipper, “FIRST we have to make SNACK!” Because this is now expected, Poppy is all, “Okay, Mary!”, and off we go to the kitchen. If NBG arrives during this time, Poppy becomes somewhat solemn, but does NOT break into immediate storms of tears. She does start asking for a nap, but I tell her, “Not yet! We’re not done making snack, remember?” and she copes just fine. When snack is done, we move to the living room, where Mary will sit down in the comfy armchair to give NBG her first morning bottle. Last week, I was putting Poppy down for her nap first. Now, Poppy is part of this. Now, Poppy will carry the bottle from fridge to living room, stand beside me as I settle myself and NBG into the chair, and then hand me the bottle. I get her to hold the end of the bottle, while I cradle NBG. Of course, NBG is a year old. She does not strictly need anyone to hold her bottle, but it’s nice for her to get a cuddle first thing in a still-a-little-stressful morning, and it’s definitely nice for Poppy to be the one to 1) have a job to do to defer that damned nap, and 2) offer NBG some comfort and nurturing, so that she can feel compassion and competence instead of fear and revulsion. Next up? Step four, which has not yet happened. At this point, though I’m sure Poppy will still be asking for a morning nap, my response will be different. 4. Poppy will help with snack, help give NBG her bottle, and help get ready to go on our morning outing. And there will BE. NO. NAP. You see? Outline her successes thus far, and then, whoosh, on to the next thing. She’ll be a little anxious, but I’m confident that with three weeks of steadily-increasing comfort/exposure to NBG under her belt, she’ll be able to deal with it. That’s on for next week. I’ll keep you posted. After a few such mornings, I am reasonably confident the nap request will diminish in intensity, from a desperate need to a mildly worried question and eventually she’ll … just forget she ever wanted one. RIGHT ABOUT THE TIME NEW BABY BOY WILL START!!!!!!! Yes, indeed. Daniel, with the advent of his baby sister, has dropped to two days a week, and so, starting after Thanksgiving (which, in these parts, is mid-October), we will be introducing New Baby Boy, for three days a week. A word on picky eaters. Right now, I have two, NBG (new baby girl) and Poppy. Well, not so much picky as unwilling. Neither of them wants to eat right now. NBG found this place very stressful the first week. When she’s stressed, NBG doesn’t eat. In the second week, this place was merely exceedingly distracting. So many things to look at! And oh! I have dogs! Who EAT FOOD if you hurl it at them! Dogs who, if you do it right, CATCH THE FOOD IN MID-AIR!!! Who needs to eat with all that wonderfulness going on? And Poppy has taken to greeting mealtimes with “I don’t want snack/lunch. I go a nap,” because sitting at a table with NBG makes her anxious. Well, some people find the thought of a child not eating very stressful. It makes them anxious. “Come on, honey. You can’t go without eating all day! Here, have a bite. Just one. Take a bite for Mary, please?” And they turn mealtime into one almighty power struggle … which the child is pretty much bound to win. Why do they do this? Mostly because they worry. They worry about the child’s nutrition. They worry about the tantrums thrown by a hungry toddler. They worry because they know how being hungry makes them feel, and they can’t stand it. They worry because they think it’s their job to see that their child eats, and if the child doesn’t eat, they’re FAILING AS A PARENT!!! So what do I do when a child won’t eat? Not much, really. I have enough on my plate juggling a stressed, integrating baby (even though she’s doing spectacularly well) and a stressed, anxious toddler, without taking it upon myself to force food into unwilling mouths. Remember the rules? I provide nutritious food at reasonable intervals. They eat. Or don’t. The adult decides what, when, where. The child decides how much, and yes, even whether. So into their chairs they all go, and then, without fuss, without making eye contact with Poppy, and certainly without saying anything, I slide a bowl in front of every child seated around that table. La, la, la, if I don’t look at you, then I haven’t really put it there. I have no expectations, I’m not talking to you, I’m not even looking at you. How did that food even get there, anyway? I run the risk that she’d scream and swipe it off the table, though I was careful to place it just a little further from her than I normally would. Not out of reach, but not in the usual eating zone. Still, it was a risk. But with my back to her, my attention carefully on the children who are eating — not that I’m saying anything to anyone about the food, because I am totally NOT (food? what food? aren’t we all sitting here just to enjoy one another’s company??) — with all that in place, Poppy just … starts eating. So that’s Poppy. She never wants to eat these days, but, given a very casual and non-confrontational opportunity to eat, she always does. You can be sure that if I were coaxing and pleading, she’d not have eaten a bite at my house in two weeks, and I’d be stressed and angry at my powerlessness and her intractability. NBG? I quickly discovered that, being 12 months old, NBG views bowls not as food containers, but as food projectiles. Put a bowl in front of her, and within seconds, the whole thing is hurtling somewhere. So now NBG gets buckled into a high chair with a few items from her bowl laid on the table in front of her. The bowl is carefully out of reach. At first she ignored the food. After two or three days, she actually ingested her favourite things. (Fruit and carbs. SURprise!) A day or two after that, she discovered the dogs as food entertainment. Daisy is always crated during meals because she’s an aggressive mooch. Will steal things right out of their hands. Indie, a passive mooch, only lies under the table and quietly hopes for things to fall. Indie is smart. Things always fall from my table. Only, with NBG, they’re not falling, they’re launched at force. “Whee! If I throw this, that doggie will leap to her feet and grab it right out of the air!! !” Fun, fun, fun. Fun, certainly. Nutritious, not so much. So now Indie is shut in another room during meals. Poor, well-behaved Indie. NBG is one of those teeny, lightweight, active children who is just not tremendously food-motivated. For her, food is fuel, and she eats what she needs. (And when you weigh as much as a pillowcase of feathers, that’s not a lot.) It also means that when she’s stressed, food is not on the radar at all. That’s okay. She was downing a couple of bottles in a day, so there were calories, and, more important, liquids, going in. I had nothing to worry about. So long as I didn’t pressure her, so long as mealtimes remained happy, interactive, social occasions, she’d relax and come around. Which, by the end of the second week, she pretty much had. She may turn into an eating machine with her next growth spurt, who knows, but for now she’s a little thing with a little appetite. But she is eating, and eating healthfully. As Poppy is a hearty thing with a hearty appetite, and she’s eating healthfully. All without any stress or pressure from (or on!) me.